The week following my last ‘cross race, I was invited to join some mates on a Bothy weekend at the end of November, and a Bivvy trip at the beginning of December. Exciting. Equally exciting was the large box that arrived from Alaska just when we got back from holiday. It was fork: steel, black and wide. Specifically, 135mm wide. It was to go with a special wheel I’d precured from Singletrack World classified the previous month. A 135mm custom Phil Wood hub laces to a Speedway Cycles Uma II 70mm wide rim and shod with a Surly Larry 3.8″ tyre. 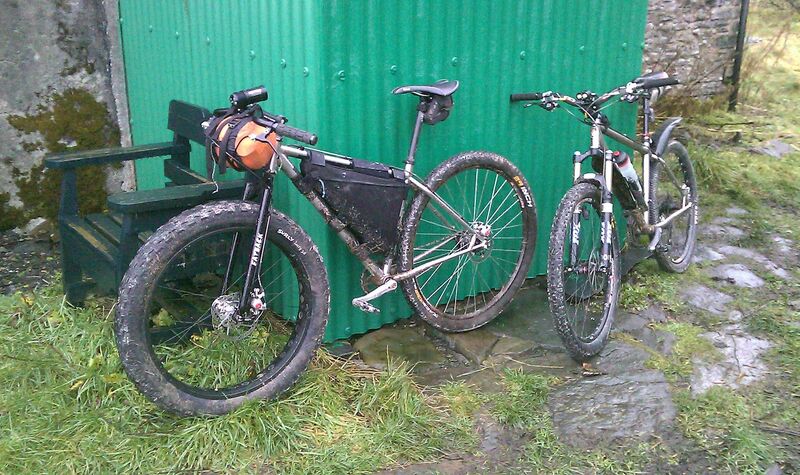 After an evening in the garage the fork was on and ready for its first ride on the Bothy trip. We rode out from Rhayader early evening on Saturday and took a winding route around the dams to Cwmystwyth before turing steeply up hill towards the forest and the Nant Rhys bothy. 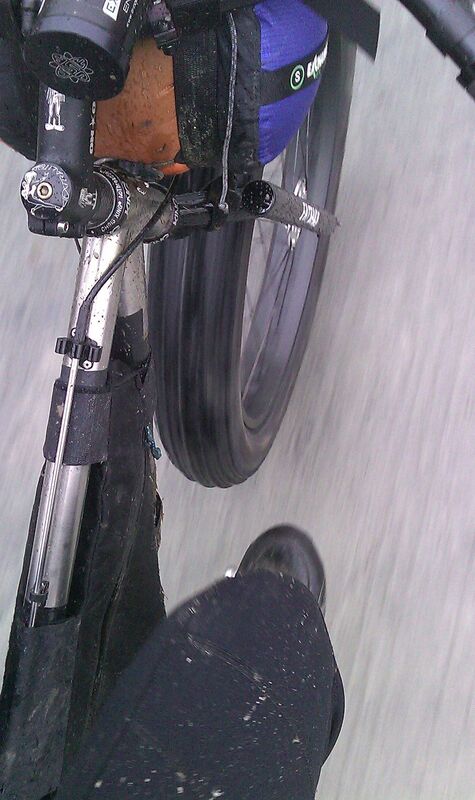 Despite the loaded bike and the singlespeed (32:20) the bike didn’t seem all that hard to pedal. Rolling resistance wasn’t that significant and while the extra weight in the front wheel was noticeable it didn’t detract from the ride. Sunday’s ride was a fairly easy, if slightly longer than planned fire road based ride designed to link the bothies of Nant Rhys and Nant Syddion. The “it must be this way” strategy to navigation failed amongst the various junction options within the windfarm above Nant Rhys. All was not lost, if you excuse the pun, as we happened to hit upon an excellent fire road descent to the north of the forest. This is where the Larry tyre started to show its benefits: all the smaller rocks and stones didn’t really feature as trail features with the tyre just soaking them up. In the corners, the large tyre footprint yielded so much more traction than I expected that allowed me to carry my speed through the corners very effectively. Finally, with nearly 35 miles ridden, I was at the top of the Golf Links descent: the final descent back into Rhayader and the final initial test for the fat tyre. Considering I was on a singlespeed with all my Bothy gear strapped to the bike, I found I was able to ride at a much faster pace than with a normal rigid fork and tyre. The Larry tyre functioned as a sort of passive suspension system soaking up the smaller stuff and not being thrown off line with the bigger stuff, and it stuck to off-camber sections of exposed rock. It was a really eye-opening ride and I got much more from the bike than I expected. Looking forward to the rest of the winter with this set up.